It’s official: I have now raised an Iron Man to 1/3 of the current maximum levels. Hurrah! among others, of course. Me? I love this zone, partly because it’s kind of disturbing. That’s the same reason why I like questing in Silithus: I hate any bugs in real life, but the big ones in game are fun to slaughter. There are a few things about this zone that I want to point out to everyone, and point you towards Hillsbrad for adventuring. Welcome to the Machine – Aside from being an awesome Pink Floyd reference, this quest is one of the best Blizzard has put in. You get to be the quest giver and dispense quests to various player “stereotypes”: Dumass, the unskilled new player; Orkus, the well-geared, end-content player who’s coming back to see the changes that the Cataclysm brought; and Johnny Awesome, the alt leveling with the aid of heirlooms and the sparkle pony Celestial Steed. The characters are hilarious, and the best part is, the person you got the quest from to dispense quests then sends you to clean up after them. A day in the life of a hero in Azeroth. Just. The text for this quest. The quest text, the progress text, the item flavour text, the turn in text, one of the rewards, everything. Perfection. Heroes of the Horde! – Just… what a quest. 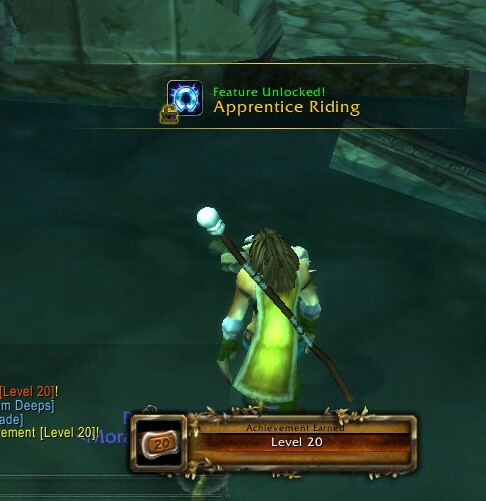 What started out as helping a truly moronic orc not drown turned into one of the most emotional quests in the level 1-60 range. You truly are a hero of the Horde. RIP Kingslayer Orkus of <Red Like My Rage>. He also shows up riding Kasha when your character is dead, which is a very touching detail. You hit the nail on the head with this one, Blizz. And, for everyone who’s against the Forsaken’s efforts in Hillsbrad, there’s this one for you: Matters of Loyalty. Drek’Thar himself, blind and in a wheelchair, coming out to berate your character for their misdeeds, and finishing it with “Yes… I have done terrible things, but nothing could ever be as terrible as lending aid to the Forsaken.” Honestly everything that I’ve ever wanted from the Frostwolf’s resident shaman and elder. Aside from all this, Hillsbrad is a beautiful zone, and has some incredible quests in it. I urge everyone to give it a second chance: you may just enjoy it in the end. …until you’ve quested in Ghostlands and you aren’t allowed to die. 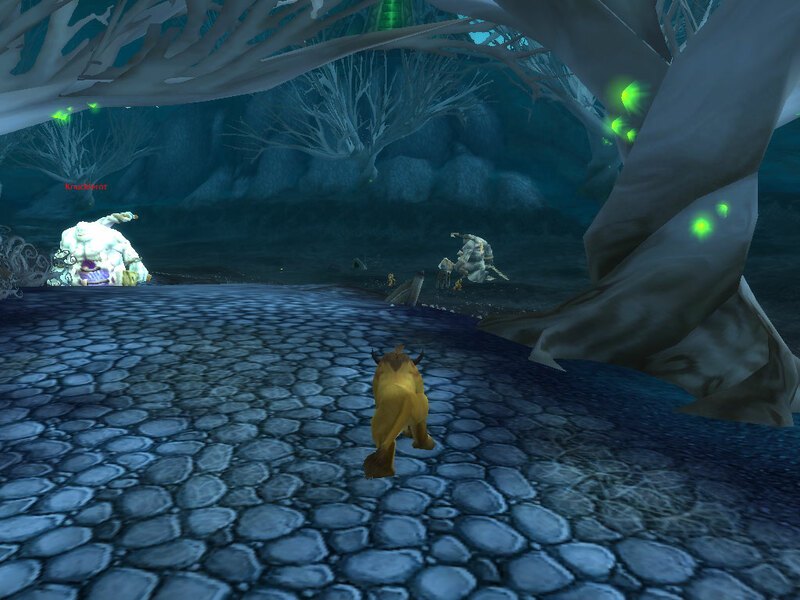 For you see, there are not one, not two, not three, but four elite quest mobs throughout the zone. Kel’Gash the Wicked is an easy kill, but the other three. Whoo, boy. As if they weren’t enough, there is still another elite quest mob: Dar’Khan Drathir. A traitorous blood (high?) elf, located in the city of Deathholme. Also a level 21 elite, he takes a lot of damage before he really gets hurt. He also deals a lot of damage, and has a fear that can send you right into as many as 4 groups of hostile mobs. Thankfully, I cleared out two of them, and he didn’t fear me into the others. While fighting Dar’Khan, I realized something that I took for granted on my main druids: Natural Insight. This is a passive ability gained at level 10 for Balance and Restoration druids, which increases your mana pool by 400%. I tend to go in cat form for questing, so I didn’t really notice it, but wow. I soloed Dar’Khan in cat and only went out to heal myself, and I ended up running out of mana – from about 8 or 9 casts of Rejuvenation. That’s crazy! My dear, sweet, precious Mora has now passed her second milestone: level 20! Hoping to get her to 90 before Warlords, but we’ll see how things go. Yes, I decided to enter a challenger into the Iron Man Challenge. Several levels ago, but she’s still pretty much the same. Meet Mora Goldenearth, younger sister of Aleer Goldenearth (one of my “four druids”, who I will be posting about later). 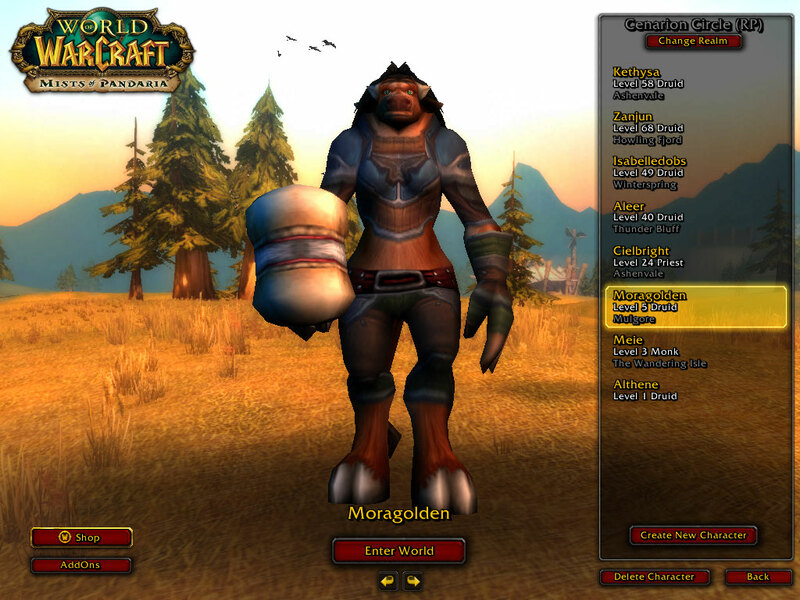 When I created Mora, she was just going to be another druid for me to level. I had already heard about the Iron Man Challenge, of course, but I hadn’t really seriously thought about making a Challenger. Just a few weeks ago, once the school year finished, I was able to get back into actually putting some time into playing WoW. I then decided to make Mora my Iron Man. Thankfully, she was only level 5, and hadn’t broken any of the rules yet. 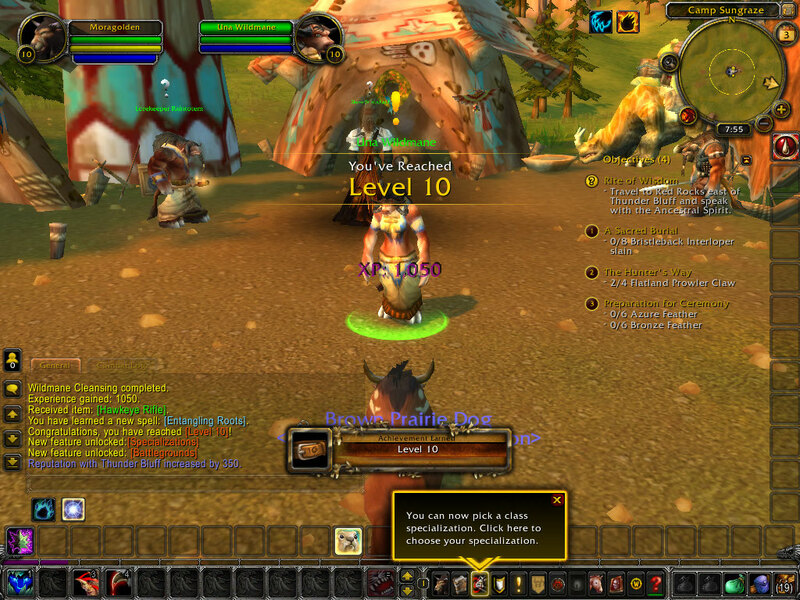 Just this morning, I got her up to her first big milestone – Level 10. 10 down, 80 to go. Wow that’s a cluttered screenshot I will be making milestone posts every 10 levels, and will do brief recaps of any important or exciting news that happens with my Iron Man throughout the leveling process. Unfortunately, I don’t have a very good track record of keeping my characters from dying. That is more than 3 deaths per level – even more so, as she is a DK. But, we shall see. Wish me luck! Anyways, yesterday was a great day. I had Deathdaisy camped out on Jaguero Isle, and Silea by the Gaping Chasm in Tanaris for about 2 weeks, waiting for rain and sandstorms, respectively. Every time I logged on to level up my druids, I would pop over to them and check for pets. I logged on to Silea early yesterday morning, and as luck would have it, it was the middle of a sandstorm! I ran down into the Chasm, and picked up a Silithid Hatchling of my very own. My new skittery little lovely! I checked in on Deathdaisy, but no luck. After playing for most of the morning, I stopped in with her again over lunch, and lo and behold: rain! The ever elusive Baby Ape is now mine! Mwahahaha! Look how fierce he is! Happy days for this pet collecter! 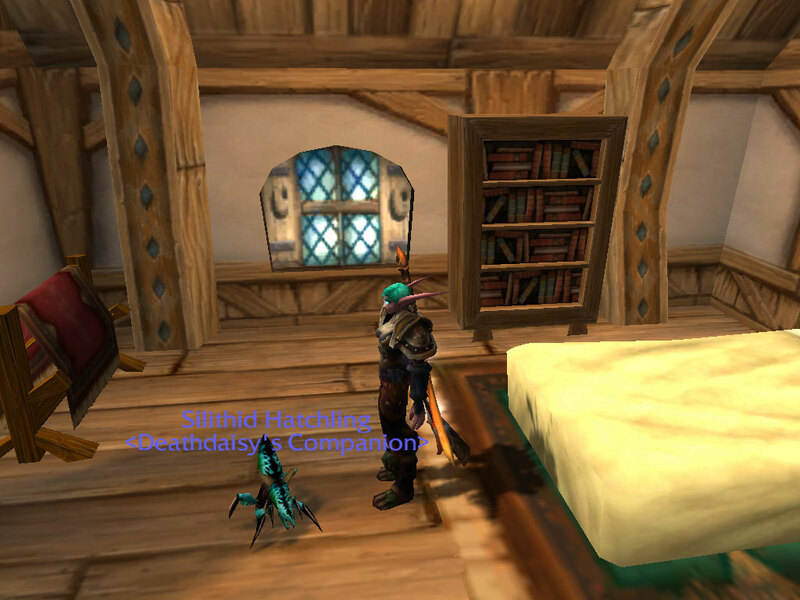 Now, I only have to grab the Minfernal for Old World-level pets, and I’ve got everything from Outland. Onto Northrend I go, once I level my Terrible Turnip up to 20 like the others. 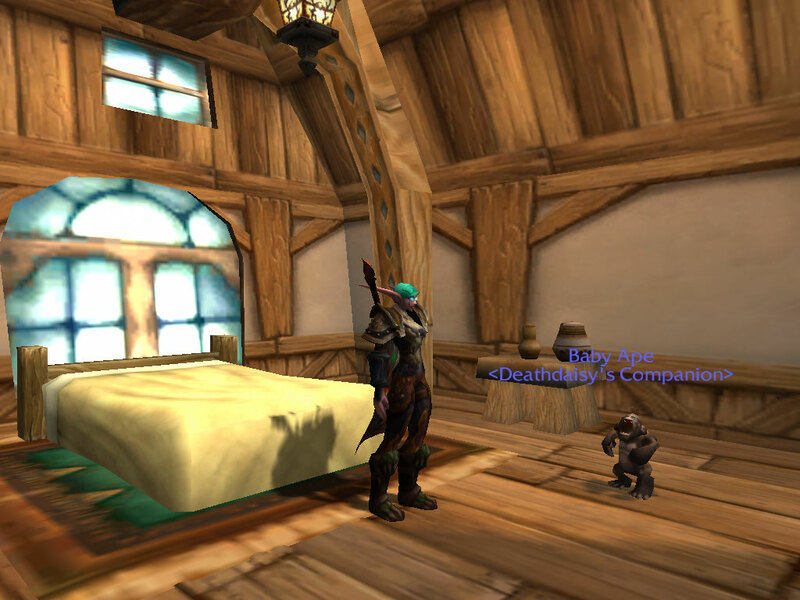 Question for you, readers: what is the most recent pet you obtained? And what is the most difficult pet that you obtained?